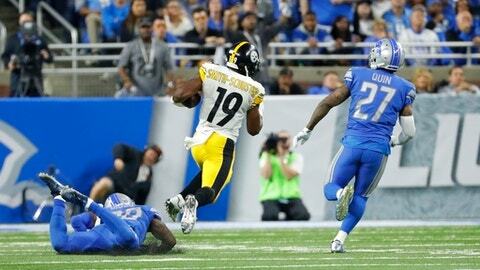 DETROIT (AP) JuJu Smith-Schuster made an inside move like a veteran and used his young legs to do the rest. ”We weren’t perfect, obviously, but boy we showed fight,” coach Mike Tomlin said. ”Just as I thought I could do something, I got hit,” Stafford said. ”Our red zone defense was amazing,” Heyward said.